including film office information and other references and data of interest to location scouts, location managers as well as other production personnel. The British Film Commission, formerly the Office of the British Film Commissioner, works to promote the UK as the best place to produce feature films. Welcome to the Aberdeen City and Shire Film Office website. We offer a free, confidential service to UK film production companies wishing to locate in Aberdeen City and Shire and also in kind support to indigenous filmmakers. The present day Aberdeenshire council area does not include the City of Aberdeen, now a separate council area, from which its name derives. Together, the modern council area and the city formed historic Aberdeenshire – one of the counties of Scotland formerly used for local government purposes. Within these borders, the County of Aberdeen remains in existence as a registration county. St Albans Cathedral (formerly St Albans Abbey, officially The Cathedral and Abbey Church of St Alban) is a Church of England cathedral church at St Albans, England. At 84 metres (276 ft), its nave is the longest of any cathedral in England. With much of its present architecture dating from Norman times, it became a cathedral in 1877 and is the second longest cathedral in the United Kingdom (after Winchester). Local residents often call it “the abbey”, although the present cathedral represents only the church of the old Benedictine abbey. It was a clear, brisk March morning in the Chilterns, a pastoral stretch of England?s Thames Valley, to the west of London, and the film director Tim Burton was looking skeptically at the sky. “What we really want is lousy weather,” said Emmanuel Lubezki, the cinematographer, who shared Mr. Burton’s concern over glimpses of sun in a country where clouds can prevail for weeks on end. Before long, the elemental status quo was restored, the skies darkened and an essential gray returned to “Sleepy Hollow,” a movie being freely adapted from Washington Irving?s American classic. Sadly and unfortunately, a British film / tv Location Manager has died of asbestos poisoning contracted while on the job. A TV production manager who worked on hit shows London’s Burning, Upstairs Downstairs and On The Buses died from asbestos poisoning he contracted while on set of another ITV show. 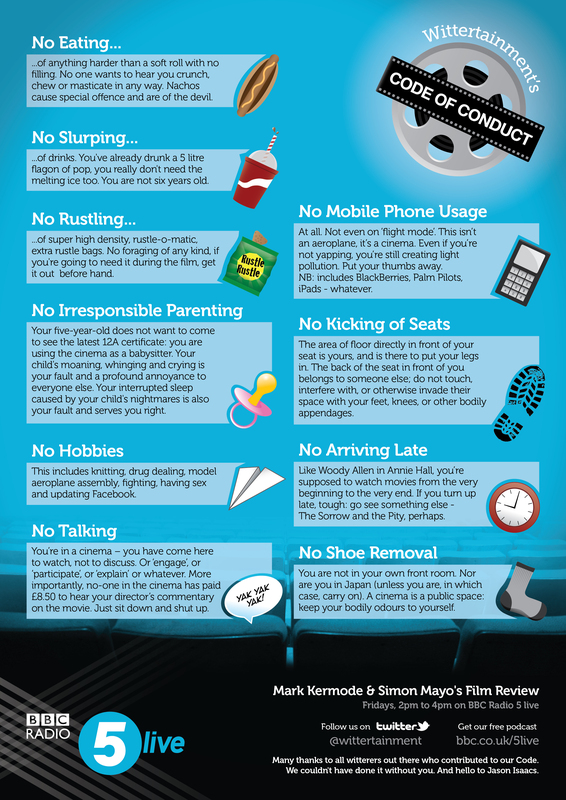 In this week’s edition of Mark and Simon’s film review programme Dr Mayo suggested cinemas should adopt a Code of Conduct. Mark agreed and his initial rules were no kicking, no talking and no texting. code_of_conduct.jpg (JPEG Image, 2480×3508 pixels) – Scaled (25%). On 26 July 2010 the Conservative – Liberal Democrat coalition announced that the council would be abolished; Woodward said that the decision had been taken with “no notice and no consultation”. UKFC closed on 31 March 2011, with many of its functions passing to the British Film Institute. The United Kingdom of Great Britain and Northern Ireland (commonly known as the United Kingdom, the UK, the U.K. or Britain) is a sovereign state located off the north-western coast of continental Europe. The country includes the island of Great Britain, the north-eastern part of the island of Ireland, and many smaller islands. Northern Ireland is the only part of the UK that shares a land border with another sovereign state—the Republic of Ireland. [nb 6] Apart from this land border the UK is surrounded by the Atlantic Ocean, the North Sea, the English Channel and the Irish Sea. …lie herein – mostly excerpted news / links about the BBC as might relate to location scouting. The British Broadcasting Corporation (BBC) is a British public service broadcasting corporation headquartered in London, United Kingdom. It is the largest broadcaster in the world by number of employees, with about 23,000 staff. Its main responsibility is to provide impartial public service broadcasting in the United Kingdom, Channel Islands and Isle of Man. The BBC is a semi-autonomous public service broadcaster that operates under a Royal Charter and a Licence and Agreement from the Home Secretary. Within the United Kingdom its work is funded principally by an annual television licence fee, which is charged to all British households, companies and organisations using any type of equipment to record and/or receive live television broadcasts; the level of the fee is set annually by the British Government and agreed by Parliament. The series, which took five years to complete, ranges all over the world, including the Arctic. The DVD box set is available in three formats: standard definition, HD DVD and Blu-ray Disc. No stone or species goes unexplored in the British Broadcasting Corp’s ambitious documentary Planet Earth, which is the first DVD to crack Amazon’s top-10 list in three formats. Narrated by Sir David Attenborough, the 11-part series took five years to complete. The filmmakers (there were 71 camera people) circled the globe to capture nature and wildlife from each continent in stunning high-definition. Settings include deserts, caves, jungles and ice worlds. Mike Fantasia is a Hollywood location manager whose work on “Memoirs of a Geisha” won him the 2005 Location Professional of the Year award. His 30-plus films include “The River Wild”, “Dante’s Peak” and “Seabiscuit”. Fantasia was the U.S. Forest Service liaison for Steven Spielberg’s 1989 movie “Always”. Since then, he has secured locations for globe-hopping films like “Catch Me If You Can” and “Munich”. He’s now scouting the next Spielberg film.